IDF troops have reportedly arrested five people from villages in the Hevron area over car attack which left one dead and 13 wounded. 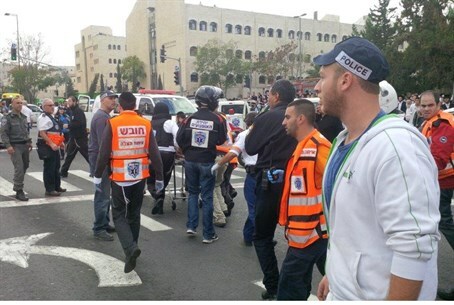 IDF troops have reportedly arrested five people from villages in the Hevron area as they continue to pursue the terrorist cell that dispatched a terrorist who rammed a vehicle into a crowd of Israelis Wednesday in Jerusalem, killing one and injuring 13. The five are said to be members of the same extended family, in the villages of Beit Awa and Dura. Palestinian Authority sources reported the arrests, adding that troops had placed both villages under curfew. Troops also searched the house of the terrorist, Ibrahim al-Akari, who was shot by Border Guard officers after the attack. In another raid, PA sources said, IDF troops entered the village of Yatta south of Hevron, and conducted searches there. Al-Akari is a known member of Hamas who lived in the Jerusalem neighborhood of Shuafat. IDF sources said that soldiers had arrested 15 wanted terror suspects overnight in Judea and Samaria. Seven of them, the army said, were being held on charges of rioting and attacking security forces. The funeral of Chief Inspector Jedan Assad, 38, the border patrol officer killed in the attack, will be held Thursday at 1:00 p.m. at the cemetery in the Druze village of Beit Jann.